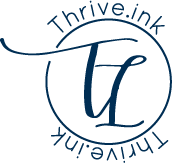 I'm so thrilled to share with you this airplane themed baby shower Thrive.ink worked over the weekend! I had so much fun dreaming up the details for this shindig! As guests walked in we asked them to sign the guestbook. 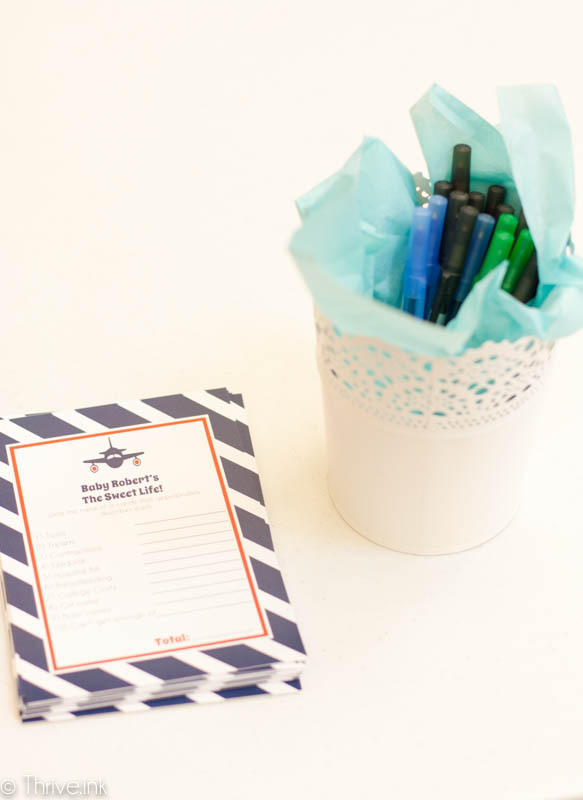 I created the 'check-in' and 'baggage claim' signs as a cute, coordinating way to show guests where to sign the guestbook and to remind them to grab a favor on the way out! 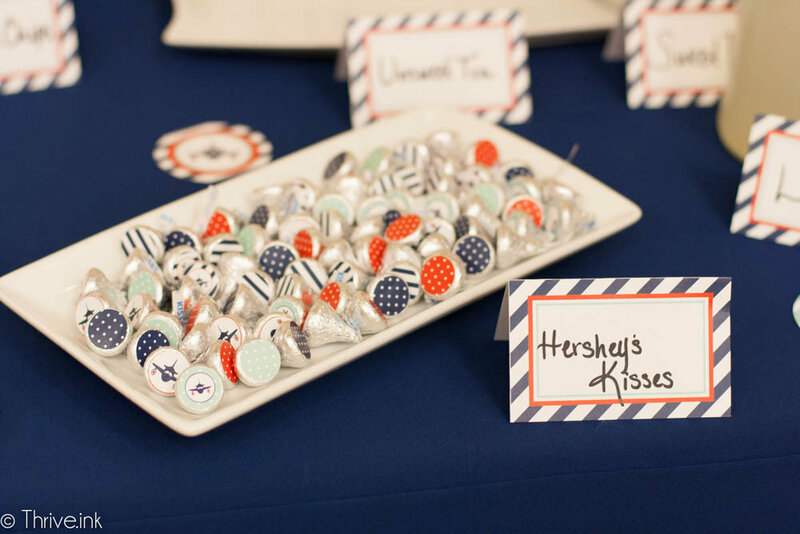 The favors were handmade by the mommy-to-be! We packaged them up in white kraft paper gift bags and attached these matching favor tags. After signing in, we directed guests to the gift table for "Luggage Dropoff." 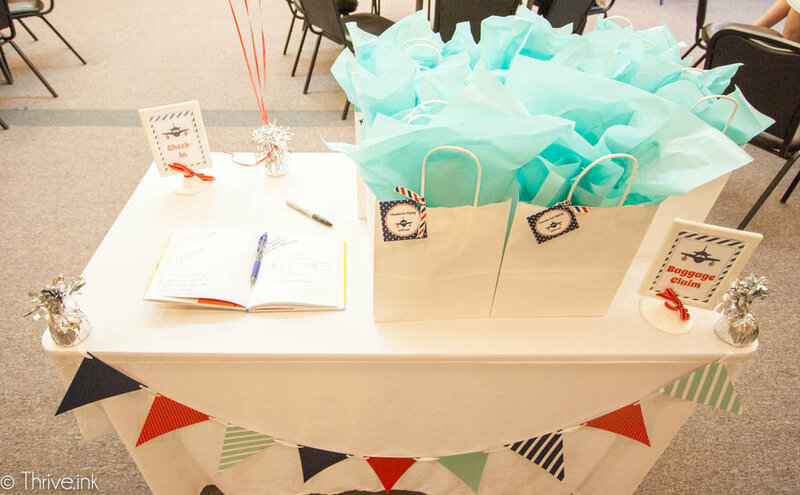 ;) For each event I do I create a custom gift list so that the guest of honor can easily see who brought what. After all the guests arrived, they were welcomed to refreshments. We snacked on ham and cheese croissants, veggies with ranch dip, goat cheese and crackers, spinach and artichoke dip with tortilla chips, chocolate dipped pretzels and Hershey's kisses. Above the food table, I custom designed a banner for baby Robert. 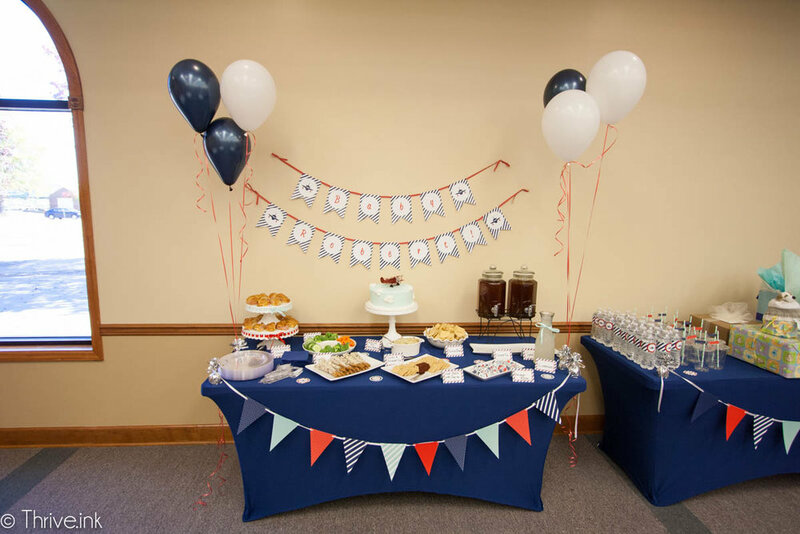 We also added coordinating patterned banners I made to all the tables. For drinks, we offered lemonade, iced tea and bottled water. After we ate, our guest of honor cut into the cake and we got to enjoy this adorable cloud cake! The mommy-to-be, Jennifer was so excited to take home the cake topper to add to baby Robert's nursery! It was such a fun shower and I was honored to be part of baby Robert's special day! Congratulations Jennifer! !